If you suspect foul play, contact your tax preparer immediately. He or she can help determine whether you’re a victim of tax-related identity theft and identify steps to remedy the situation. In 2015, the IRS formed the Security Summit Group, a collaboration of federal and state tax agencies and tax practitioners to find new ways to protect taxpayers and safeguard the tax system. In 2016, Security Summit Group efforts led to a 50% reduction in the number of new reports of stolen identities on federal tax returns compared to 2015. One example of the new-and-expanded safeguards for taxpayers is the introduction of a Form W-2 Verification Code. Starting this tax season, certain payroll service providers will have to supply this 16-digit code to help the IRS validate wage and tax withholding information. The code is expected to appear on approximately 50 million W-2s in 2017, up from 2 million forms in 2016. If your W-2 contains the code and you file taxes electronically, make sure your tax preparer enters it on your 2016 tax return. The IRS will still accept your tax return without the code. But including it could help speed up your refund and reduce requests from the IRS to provide additional information to verify your identity. You may wonder how many taxpayers file electronic vs. paper returns. “There are 150 million households that file federal and state tax returns involving trillions of dollars…. More than 90% of these tax returns are prepared on a laptop, desktop or even a smartphone — whether they’re done by an individual or a tax preparer. This is a massive amount of sensitive data that identity thieves would love to get access to.… With 150 million households, someone right now is clicking on an email link they shouldn’t, or skipping an important computer security update, leaving them vulnerable to hackers,” said IRS Commissioner John Koskinen in a recent statement about the Security Summit Group. 1. Keep your computer secure. Simple, cost-effective security measures add up. For example, use updated security software that offers firewalls, virus and malware protection and file encryption. Be stingy with personal information, giving it out only over encrypted websites with “https” in the web address. Also back up computer files regularly and use strong passwords (with a combination of capital and lowercase letters, numbers and symbols). 2. Avoid phishing and malware scams. Be leery of emails you receive from unknown sources. Never open attachments unless you trust the sender and know what’s being sent. Don’t install software from unfamiliar websites or disable pop-up blockers. 3. Protect personal information. Treat personal information like cash. Don’t carry around your Social Security card in your wallet or purse. Be careful what you share on social media — identity thieves can exploit information about new car or home purchases, past addresses, vacations and even your children and grandchildren. Keep old tax returns in a safe location and shred them before trashing. 4. Watch out for scammers who impersonate IRS agents. IRS impersonators typically demand payment and threaten to arrest victims who fail to ante up. 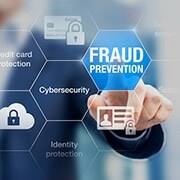 The Federal Trade Commission recently issued an alert about police raids on illegal telemarketing operations in India that led to the indictment of dozens of IRS impersonators. Remember: The IRS will never call to demand immediate payment, nor will they call about taxes you owe without first mailing you a bill.